You know why? Because I don't think the government belongs in any marriage. Government is a necessary evil. It doesn't belong in every aspect of our lives. Instead of legalizing gay marriage, I'd rather see the government get out of straight marriage. Then it's the same for everyone (including polygamy people, ever stop to think about them? Huh? Me neither) and we don't have the government stinking up a social institution and/or religious institution. Marriage is real if it's real. The government doesn't make it real. So what brings on this soliloquy? What prompts me to share my opinion despite the conspicuous lack of people begging me to share my mind on this subject? 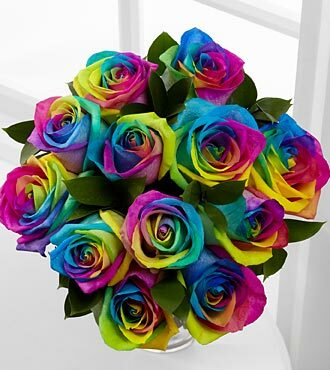 These awesome rainbow roses. OMG, they make me wish I had some gay friends who were getting married so I could give them some. Rainbow roses! Wow. Pin It Now!